Stocks in Asia have driven down following a crash on Wall Street after US traders came back after a holiday on Wednesday. Selling pressure in the CME was so intense that the group was forced to pause trading (SP500 futures were falling almost 2% shortly after the reopening) and as a result similar moves have been seen across Asian markets. The Hang Seng (CHNComp) has been hit the most so far being down roughly 3% at the time of writing while the Shanghai Composite is falling 1.6%. The NIKKEI (JAP225) closed the day 1.9% lower (the higher yen was a drag). We were offered the downbeat news which for sure did not help improve moods among investors. Namely, the Canadian authorities arrested the China’s Huawei CFO, Meng Wanzhou, for possible extradition to the United States. She was already arrested on Saturday. Today the China’s embassy in Canada criticized both Canada and the US for wrongfully arresting her and demanded an immediate release. Let us add that Huawei’s CFO was arrested in relation to possible violations of US sanctions against Iran by selling telecommunications equipment. In turn, China’s press said that neither the US nor Canada has a right to detain a Chinese citizen. It also added that Meng Wanzhou has become a hostage in the China-US trade war. Such comments do not help improve relations between the US and China and are expected to contribute to a possible trade war escalation, and if so it could not be supportive of equities. On the currency front the Aussie dollar is standing out the most being by far the weakest major currency in early European trading. It is trading almost 0.7% lower while the NZ dollar, the second poorest currency, is falling 0.45%. The Aussie got a bag of mixed data this session with a disappointment in terms of trade and quite a positive reading of retail sales. 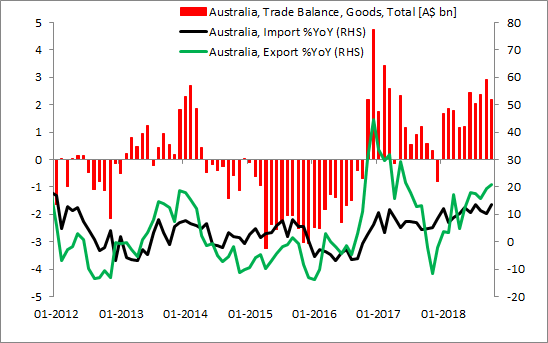 The trade data for October produced a surplus of 2316 million AUD compared to an expected surplus of 3000 million AUD - exports grew 1% MoM while imports rose 3% MoM. A bit rosier result came from retail sales for October as it matched the consensus coming in at 0.3% MoM, the value for September was revised down to 0.1% from 0.2% though. On top of that, the Aussie dollar is also feeling the pain of dismal moods across equity markets. On the opposite side we have the yen trading 0.3% higher, the Swiss franc and the US dollar are treading water.